Using local field teams, Vital Signs gathers on-the-ground measurements across a variety of indicators and also analyzes existing data sources. 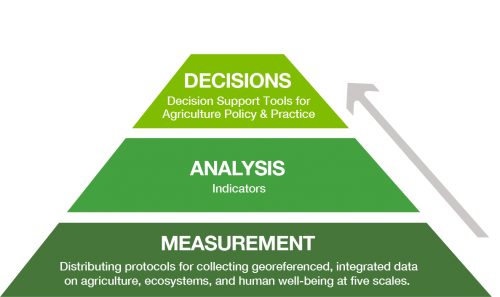 These measurements help to create an accurate picture of the relationship among agriculture, nature and human well-being. Vital Signs “Key Indicators” include: sustainable agricultural production, water availability and quality, soil health, biodiversity, carbon stocks, climate resilience, household income, nutrition and market access. A key goal of Vital Signs is to minimize unintended consequences of agriculture on people and nature. It provides the key data and the analytical tools that decision-makers need to evaluate trade‐offs, manage risk and inform decisions. By doing so, it influences policymakers to work toward resilient ecosystems and sustainable livelihoods for smallholder farmers. Vital Signs is committed to increasing local and national capacity for environmental monitoring among scientists, government leaders, the private sector, and civil society— throughout Africa and the entire world. Vital Signs is an accessible, transparent information resource system for everyone to use. The idea is simple: The more people who have access to data and decision tools the better it is for people, nature and agriculture. Click here to view or download our Overview Factsheet PDF.